WASHINGTON, D.C. -- In 2013, one in seven adults worldwide (14%) who are not already business owners said they plan to start their own business in the next year. Entrepreneurial intent was highest in sub-Saharan Africa, where more than one in three respondents (35%) planned to start a business, and lowest in the former Soviet Union countries (5%) and Europe (4%). Entrepreneurial intentions tended to be highest in regions where many new businesses are born out of necessity rather than opportunity. Limited job opportunities in less developed countries tend to drive up intent to start a business. In the absence of well-paying jobs, residents turn toward self-employment. Sub-Saharan Africa and the Middle East and North Africa region, where 23% planned to start a business, had the lowest Payroll to Population (P2P) employment rates in the world in 2013. Intent to start a business declines as economic growth increases, since people can find jobs with higher wages. This helps explain why plans to start a business were lowest in the more developed countries of Europe and the former Soviet Union. These countries had some of the highest P2P rates in the world 2013. In the 14 countries surveyed where more than 40% of non-business owners planned to start businesses in the coming year, 11 were located in sub-Saharan Africa. Majorities in only two countries planned to start a business, including Malawi, where 57% -- the highest figure in the world -- intended to do so. Many of the countries at the top of this list lack mature markets, offer few job opportunities, and are primarily agricultural economies or exporters of the natural resources. These are all conditions that propel a large proportion of population toward self-employment, especially in the informal sector. Starting a business in such environments may be the only way for residents to generate income. Though surveying took place before the outbreak, several of the countries on this list are among those most heavily affected in the current Ebola epidemic, including Guinea (47%), Sierra Leone (47%), and Liberia (41%). Since then, the outbreak has disrupted all aspects of people's lives in these countries, potentially delaying aspiring entrepreneurs' plans to start a business, which may hurt private-sector job growth in the long term. Entrepreneurial intent is in the single digits across all the countries and areas in Europe, except for the area of northern Cyprus (18%), Cyprus (11%), and Kosovo (10%). 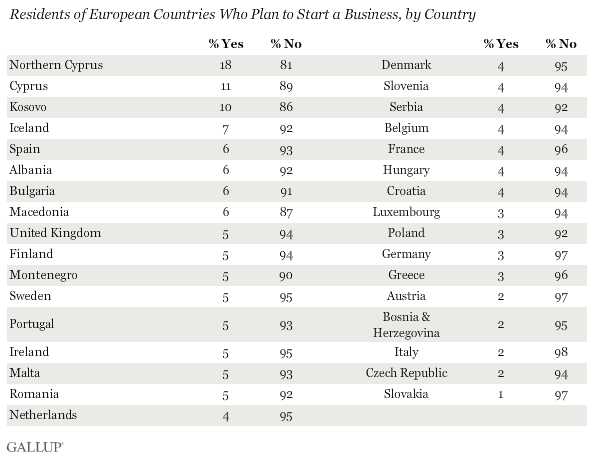 In most European countries and areas, between 3% and 7% of non-businessowner residents were planning to start a business in the next year. The better the prospects are of steady income from wage employment or unemployment benefits when compared with starting a business in these countries, the less likely people are to consider starting a business. Slovakia (1%) had one of the lowest figures of budding entrepreneurs in the world. Meanwhile, in the Czech Republic, Italy, Bosnia and Herzegovina, and Austria, 2% were planning on launching businesses in the next year. Entrepreneurial intentions are also low in countries that were formerly part of the Soviet Union. In Russia, for example, only 37% say their communities are good places for entrepreneurs who want to start new businesses, and 69% say the government makes it hard to start new businesses. This may reflect that, despite a move to the market economies in many nations in this part of the world, many in the region view the climate as generally poor for starting businesses. In only a few countries and areas -- Uzbekistan (14%), Tajikistan (11%), the Nagorno-Karabakh region (10%), and Kyrgyzstan (10%) -- did the percentage planning to start a business move into double-digits. Although many in sub-Saharan Africa said they planned to start businesses in the next 12 months, this reflects the lower development levels in a region where businesses are more often born out of necessity than opportunity. But even these aspiring business owners face barriers to the training and funding they need. 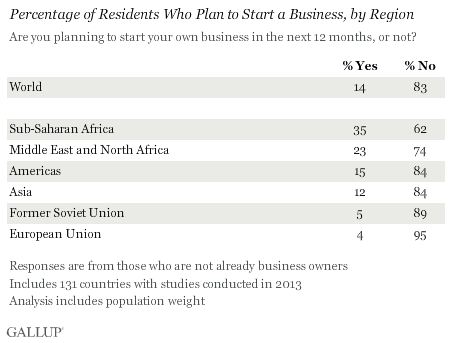 In Europe and former Soviet Union countries, the percentages who said they planned to start their own businesses are much lower. In more developed countries, these businesses are likely to be created out of opportunity than necessity, but potential entrepreneurs in these regions face barriers as well. Many in these countries generally do not see their governments as supportive of business endeavors. This situation could potentially be a barrier to future job growth in countries that are still struggling to recover from the global economic crisis and the recent eurozone crisis. Sangeeta Badal, Senior Researcher, Entrepreneurship at Gallup, contributed to this report. Results are based on telephone and face-to-face interviews with approximately 1,000 adults in each country, aged 15 and older, conducted in 2013. For results based on the total sample of national adults, the margin of sampling error ranged from ±2.1 percentage points to ±5.6 percentage points at the 95% confidence level. The margin of error reflects the influence of data weighting. In addition to sampling error, question wording and practical difficulties in conducting surveys can introduce error or bias into the findings of public opinion polls.